When you’ve found the perfect T-shirt, you just know it. It feels nice, it fits right and it helps you make a good impression. 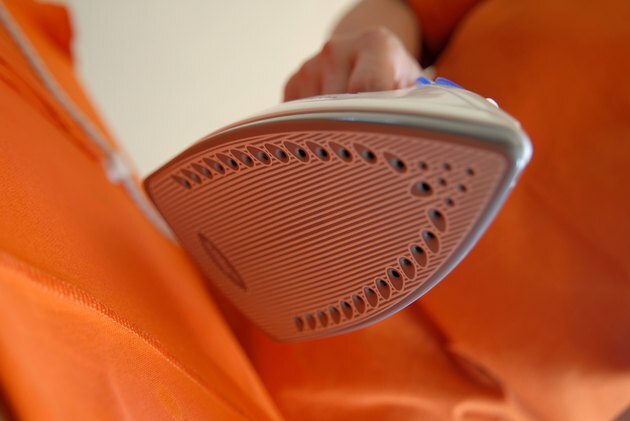 If your shirt is full of wrinkles, however, it’s more likely to say “I just got out of bed” than “This is my perfect T-shirt.” Ironing your T-shirt before you put it on will help keep you looking your best. Set up the ironing board. If you’re right-handed, put the wide end of the ironing board to your right. If you’re left-handed, do the opposite. Adjust the height so the ironing board rests at waist level. Fill up the iron to the fill line with water and plug it in. Check the tag on the T-shirt to figure out what kind of fabric it's made of and set your iron on a setting that works with the fiber content. For example, most T-shirts are made of cotton or cotton-blend, so that would require the hottest setting available. Spray the shirt lightly with water if it has a lot of wrinkles. Wrap it up and let it sit for about 10 minutes to let the moisture distribute evenly throughout the shirt. Open the wide end of the shirt and slide the shirt over the narrower side of the ironing board so the two layers of fabric are separated. Smooth the shirt down. Press the iron down near the neckline of the shirt and move it from the collar to the hem using light and short strokes. Move slowly and don’t hold the iron in one place for too long. Be careful to not stretch the fabric as you move the iron --this can cause the T-shirt to become misshapen. It's better to press and lift the iron than to drag it along. Take the T-shirt off the ironing board and flip it over. Slide it back onto the ironing board, this time with the back facing up. Place the iron near the collar and move it from the top of the T-shirt to the bottom and repeat, covering the entire surface of the shirt. Remove your shirt from the end of the board and lay it flat on top. Smooth the sleeves out it out with your hands, making sure no folds or creases exist in the top or bottom layer of fabric. Place the iron at the seam by the shoulder and lightly press it down. Flip over the shirt and repeat the process on the back of the sleeves. Double-check the iron's temperature so it's on the right setting for the T-shirt fabric. If it's too hot it can ruin the fabric. If it's too cold, it won't effectively remove wrinkles. If your tap water is hard, use distilled water in the iron to avoid mineral buildup that can accumulate and clog the steam holes. Keep the iron moving. If you hold it on one spot too long, it can leave a scorch mark or burn a hole through the fabric.